It's a Mod, Mod World. Step back in time with spring's soft and sweet retro looks. 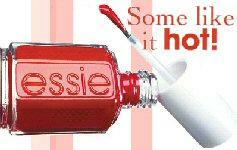 The season's fashions blend pale and pretty with a dash of bright and beautiful, and so do Essie's newest confections. 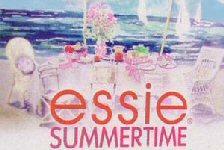 Splash out with bubble skirts, psychedelic prints, geometric haircuts, clackety bangles or plastic fantastic swing bags. Just make sure you've got your platform shoes and these six marvelously Mod new shades to get you in the groove. Fashion follows the tracks of the cat this season with ferociously feminine results. From faux leopard shoes and bags, fuzzy tiger print belts and spotted silk dresses; this style teases with just a touch of savage. 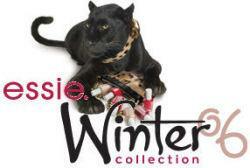 And Essie's got six untamed, shimmering shades to set off these wild prints, making this the purr-fect time to be a fine feline. Six new sumptuous shades of rich natural suedes and deep leather browns add just the right spice to accent beautifully manicured hands. 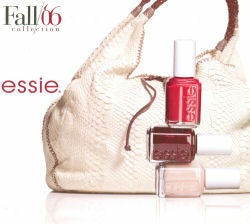 Celebrating 25 years of innovation with six new shades that are quintessentially Essie: flirty, feminine, and fabulous. The Anniversary Collection has something for every woman - from sheer to silky, shimmer to shocking, these six simply beautiful new shades are destined to become classics. Add the perfect finish to this summer's look, one of Essie's six new polish shades ranging from subtle to sultry, and you'll have everything you need to be clever and colorful from tip to toe. It's a warp! 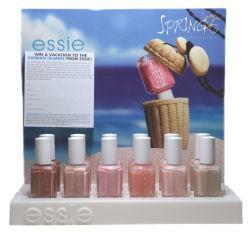 Essie presents six reasons to embark on the path to relaxation with the introduction of the Spring '06 Collection. Made up of six fantastic new nail polish shades, the collection was designed to capture the energy and culture of the Cayman Islands. A little glitz, a lot of glamour - this holiday season is going to be about celebrating the hourglass figure, dressing to the nines and bold accessories. 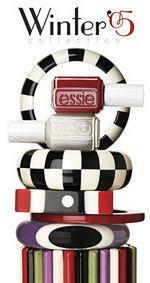 Essie's presents six brand new colors designed to coordinate with winter fashions and provide the ultimate accessory for any stylish ensemble. Kick off the season with polishes created to compliment the catwalks' rich jewel-toned knits and deep-hued leathers. 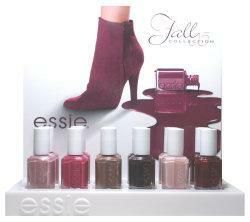 Essie presents a palette of rich fall shades, with intense bordeaux and burgundy balancing out romantic mauve and violet. Both powerful and passionate, these precious polishes will have you walking tall. 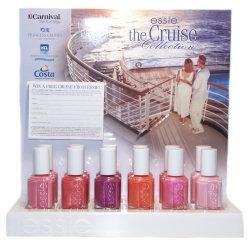 Six brand new nail polish shades created with luxury cruising in mind. This bright new collection is perfect for a cruise vacation or just a little summer fun and relaxation. Be creative - this is the season where anything goes! 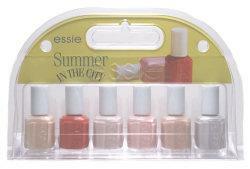 With Essie's Summer in the City Collection, you can spend the summer in style. Six feminine shades to set off all the fashionable froufrou of the season. Embrace the season's simplicity with Essie's new Bare Necessities Collection - the six new colors will create the right foundation for, and perfectly set-off, the must-have clothes and accessories of the season. This spring, keep it simple but beautiful, fashion trends are all about clean lines and natural color.